Paragliding has been a sometimes exhilarating, sometimes terrifying, sometimes exhausting, but always incredible experience. It all started back in September. Nicole and I had gone for lunch, and there was another waiguoren (foreigner) in the cafe. Living in a small town means that foreigners typically are friendly to each other, because it’s rare to bump into another outsider. So we said hello. His name was Ken, and we only spoke for a few minutes. But in that time we mentioned that we’d recently been at the hot air balloon festival in Taidong. “Oh, really? I was flying out there!” was his reply. Obviously that prompted questions about whether he flew hot air balloons. 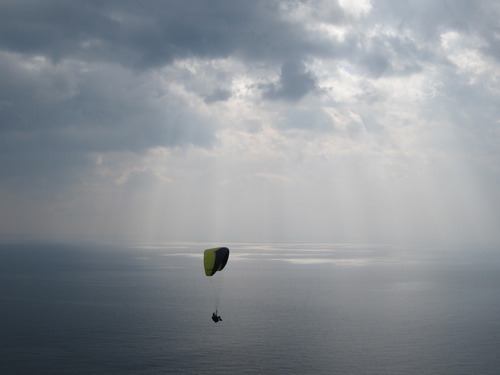 But no, he was a paraglider— and had in fact been in the sky the day Nicole and I had been there. I told him that I had always wanted to try paragliding. We exchanged numbers, and he said he’d help us get into the sport. About a week later we followed him to Saijia, a place in the mountains close to Sandimen (where the Liangshan waterfalls are). After taking us to the landing zone and introducing us to his friend, Karlis, Ken showed us the way up the curvy mountain road to the takeoff site. We could see an endless expanse of countryside from the top, leafy green forest, a dry river bed, and patches of pineapple fields. The clouds were gray and hung over us threatening rain. We sat there, waiting for the wind to pick up so the pilots could fly again, and began to get to know each other. Karlis spoke with a heavy Latvian accent and had serious eyes. He was intensely focused on the sky. After awhile he stood up, spread his blue and yellow wing out, and with a flick of his wrist it rose up above him. In one fluid motion he spun around and was suddenly rising from the ground. He rose, quickly, right up to the heavy clouds. Nicole and I watched with wide eyes and bated breath as he moved through the sky. We were sold. After that, we knew we had to learn how to fly. A few days later we received a message from Karlis, offering to be our coach. We took him up on it right away, and plans were made to begin training. 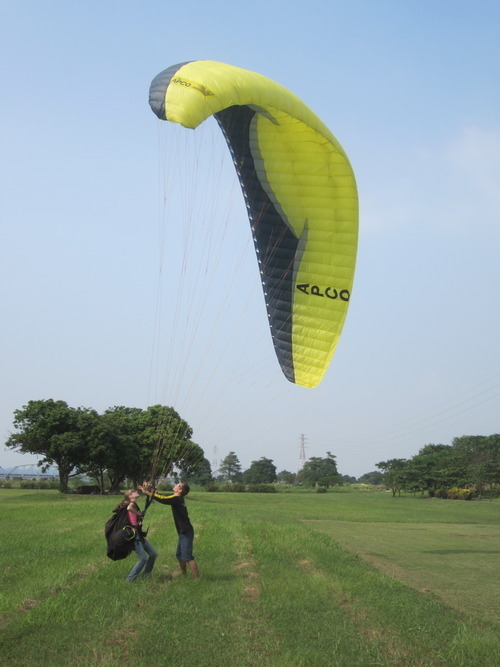 To learn to paraglide, you have to start on the ground. Knowing how to kite the wing, to get it up, stabilize it, and move with it is critical if you’re going to takeoff or land. For a week we were up early every morning; coffee helped with that. Our days were spent out in an open field trying again and again to get the wing up over our heads. Karlis was new to coaching, but he never acted that way. Although he started out being serious and focused through every lesson, after awhile he began to loosen up and the three of us spent the time together easily. We learned fast— or at least, that’s what we’ve been told. At the end of the first week we did “bunny hops” (flying from hills, just to test the feeling of being in the air), and then by that first weekend we were ready to really fly. We woke up painfully early, then with Ken showing us the way we headed to a place called Lion’s Head. We met Karlis there, below the mountain where we were going to fly. My nerves were making my skin tingle and my heart race. It was hard to think that soon I’d be going over the edge of a cliff side. Karlis showed us where and how to come in for the landing, then we made our way to the take off site. The cliffs were about 500ft high. The mountain sat right at the edge of the coast, and so we were looking out at sea and mountain all at once— in a place that would be breathtaking if you were just sitting there enjoying the view. But my breath was already gone. I was going to fly first. We spread out the wing, like I’d practiced half a hundred times in the field. It took several tries to get it up and steady overhead, but on my fourth try it was up, stable, and I turned around. Karlis shouted— “Run!” and I did— right towards the edge of the cliff. But before I got there the wind had filled the wing and was pulling me up into the sky. I have to admit, I barely remember my first flight. My hands shook and my breath stuck in my throat. Karlis told me what to do over a radio, and I clung to every word. The ground was a blur, but I was completely aware of how far away it was, with nothing but me and the wing moving through the open air. I was too high to land, so I had to do a 360 to drop lower, and I had to mentally force myself to weight shift into the turn. But I did, and I came in for an easy and smooth landing. As soon as my feet touched the ground I was suddenly bursting with excitement— I could fly! I instantly wanted to go again, to calm my nerves and enjoy the flight, to learn how to catch the wind and rise higher, to stay in the sky. Nicole flew next, and felt the same way I did at the end of the day. After that, we flew as often as we could. Paragliding can test your patience— “parawaiting” is a fitting nickname for the sport, because so much depends on the weather and the wind. We flew at Saijia, and again at Lion’s Head. The days were mostly good, but not always. One afternoon we were able to stay in the sky for hours at a time. Other days we wouldn’t be able to fly at all. I developed a fear of taking off that I had to get past. Nicole’s landings weren’t always quite as soft as they should have been. But we both kept working on it and learned how to deal with those problems. Being in the sky is unlike anything else I’ve ever experienced. 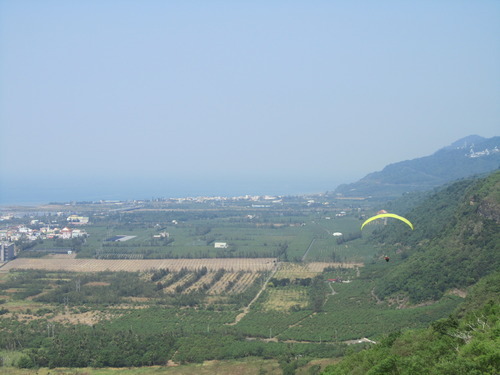 Paragliding isn’t the same as skydiving, which is all adrenaline and rushing through the air, making a quick and steady descent to the ground. 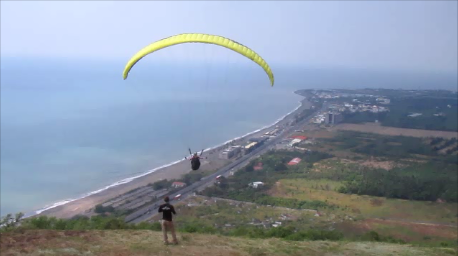 With paragliding, you’re actually flying. You catch the wind and go higher, you soar through open sky, weight-shifting, circling, staying in the air as long as you can find lift. There are scary moments, to be sure, but for the most part flying is freeing— it’s exhilarating and incredible. The time spent in the sky is just this constant wonder at how it’s even possible that you’re so far from the ground, gliding over distant treetops. 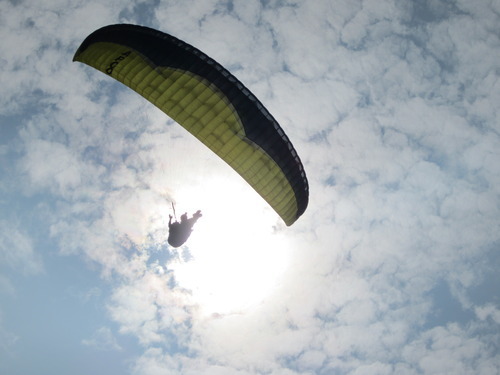 The month of October raced by in a blur of paragliding obsession. It became an “eat, sleep, paraglide” situation for awhile. But then we got into the groove of things and remembered life beyond just the sky; we had Halloween, we went camping and taught Karlis how to make the classic American s’more, we spent a day at the beach jumping in the waves. Sadly, for now, our paragliding phase is over. Karlis was hired to fly tandem flights through the Himalayan mountains of Nepal, and we were using his wing. Nicole and I are currently looking into getting our own paraglider, so we can stay in the sky. It was an amazing month, and I am so happy that chance made me bump into Ken that day, and that Karlis was able to teach us.